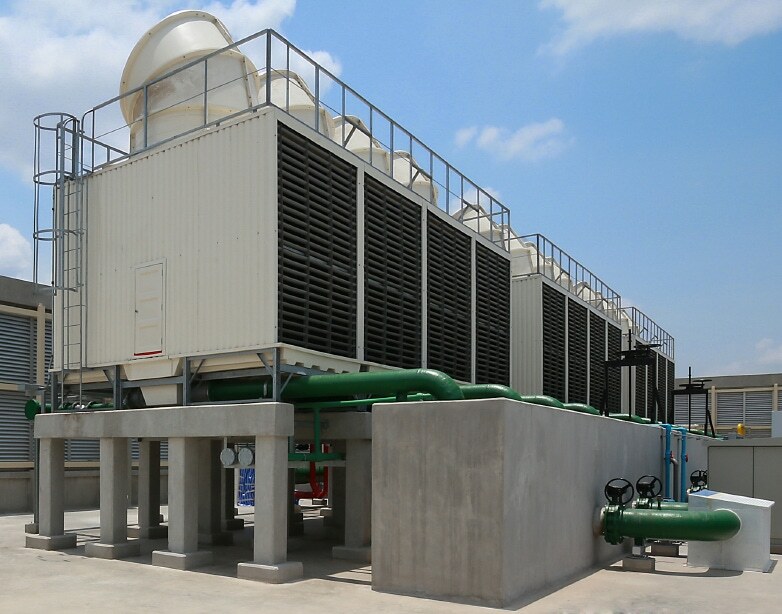 Baltimore Aircoil, one of the largest cooling tower manufacturers in the world, published a technical article entitled The Value of Maintaining Evaporative Cooling Equipment. 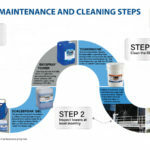 The article notes the relationship between cooling tower cleaning and overall system performance; “Cooling tower components must be kept clean and free of obstructions. Neglecting the cooling tower will lead to higher than desired return water temperatures to the system, which will result in higher energy usage”. How does all of this equipment connect and contribute to overall system function? A chiller works by removing building heat (heat from people, lights, computers, etc…) from inside the building and rejecting that heat to the condenser water loop. When the condenser water absorbs the building heat, the water warms up and is pumped outside to the cooling tower. The cooling tower extracts the building heat from the condenser water and rejects the heat to the atmosphere. As the heat is transferred out of the condenser water, the condenser water cools down and cool water is pumped back to the chiller to absorb more building heat. If the cooling tower is clogged with scale and slime, the tower cannot effectively extract building heat from the condenser water, so the condenser water remains warmer than it should be. The warm water is pumped back to the chiller and the chiller has to work extra hard to push new building heat into the warm condenser water. 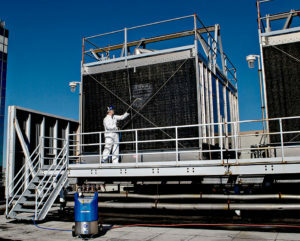 The Baltimore Air Coil article mentioned above, explains that “[a]s little as 1°C higher [return condenser water] temperature can result in 6% more energy being consumed by the chiller.” The overall system efficiency drops because of the dirty cooling tower, resulting in higher utility bills and greater wear on the chiller. A cooling tower is actually a simple piece of equipment to maintain. However, since the tower is frequently not installed on the roof near other HVAC equipment, it suffers from being out of sight and out of mind. “The cooling tower is often the forgotten component of the system when it comes to maintenance” says a Baltimore Air Coil representative during a cooling tower maintenance interview. Cooling tower cleaning, an integral part of maintenance, includes scale removal and treatment for biological contaminates. 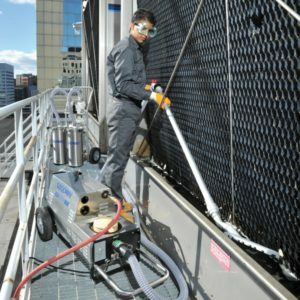 Cleaning and treating cooling towers is easier when technicians have the right tools and chemicals. 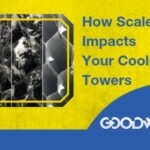 Goodway offers several cleaning systems including some specifically designed for removing accumulated scale on tower fill. The TFC-200 lets maintenance staff spray a descaling solution such as ScaleBreak®-Gel directly onto the fill to dissolve buildup without damaging the tower fill itself. Once the scale is dissolved away, technicians can change to a turbo nozzle in high volume mode to rinse off the fill. The same TFC-200 can be used to apply a cleaning solution during maintenance like the EPA registered Goodway BioSpray®-Tower. This EPA registered disinfectant kills 99.9% of Legionella pneumophila when correctly applied to hard, nonporous surfaces like cooling towers. Clean, debris-free heat transfer surfaces within the chiller are an absolute requirement for an HVAC system to remove building heat efficiently. Since water cooled chillers come in a variety of sizes, and the deposit in tubes can run from mud to limescale, Goodway also offers chiller tube cleaning equipment in a range of sizes to help technicians. Their large selection of accessories provides for the selection of properly sized brushes and tools for the particular chiller being serviced. 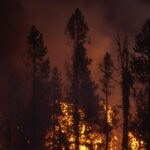 If you want to learn more about that, see these articles. There is no way around the necessity of cleaning and descaling cooling towers and water cooled chillers. Both pieces of equipment have to be regularly serviced to keep surfaces free of deposits that inhibit heat transfer and hurt efficiency. Goodway has the tools and cleaners to help maintenance staff stay on top of preventative maintenance tasks for all of their equipment. Watch our webinar on Preventative Maintenance for Cooling Tower Systems.